Like it or not, 2011 is here, and it’s time to pony up to those New Year’s resolutions. If you’ve resolved to train for this summer’s hiking tour, but you hate lifting weights and running in place, then try these five, fun-filled, gym-free alternatives for getting your legs back into shape. You don’t have to run on a hamster wheel to improve your fitness. 1. Walk, Hike, Run. Nothing will better prepare you for an upcoming hiking tour then, need we say it? hiking. Start small, with low miles and limited effort, and slowly work your way up. Do it often. The key is consistency. Three short walks every other day are better than one long hike every other week. Take your pack. Hit the local woods. Explore the neighborhood. You don’t need a national park to enjoy a good walk. Feeling strong? Try running. “But what if I run out of daylight?” Grab a headlamp. Night hikes/jogs are a blast. 2. Snowshoe. Hiking can be tough with measurable amounts of snow. Fortunately, snowshoes come in so many sizes and models these days that there is really no excuse to avoid the white stuff. They even make small, lightweight models for runners. Atlas and Tubbs are two of our favorites. 3. Nordic Ski. There’s something about effortless gliding that makes me smile. 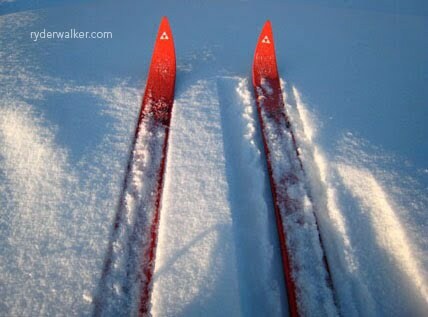 You can cover a lot of distance on skis, making it easy to get into a steady rythm. Get up to speed, find your groove, and watch your fitness unfold. Nordic skiing also provides a total fitness package. You’ll work your arms, back, chest, stomach and your lower body as well. You might not work your muscles in exactly the same way as hiking, but your improved cardiovascular system will help you power up French slopes during the summer. Start now, and enjoy admiring looks from your friends at the trailhead this spring. They’ll will wonder what you’ve been up to. Better yet, show off your new fitness by skiing from chalet to chalet on our Winter Engadine Holiday. 4. Bike. Some parts of the world have been ravaged by cold and snow, but some haven’t. Like nordic skiing, the low impact cardiovascular benefits of cycling will have you feeling like a powerful V8. Remember, muscles need copious amounts of rich, oxygenated blood to produce power, and a strong cardiovascular system is the key to that. Dust off that old ten speed and get going. Again, start small but go often. Keep it fun. Take the kids. Ride to the store. Increase the mileage and intensity as you get stronger. Put your family on a trailer and pull. Bicycling Magazine offers tips for getting started. 5. Enhance Your Commute. It can be tough to exercise with a busy work schedule, but, depending on your living situation, you might be able exercise while you commute. If you live anywhere near your workplace, then commuting by bike might be a viable option. You’ll save gas money, you’ll cut down on pollution, and you won’t have to wait in traffic jams. You might even find that commuting by bike is faster than driving a car. Think of it as feeding two birds with one seed. You’ll gain fitness while doing something that you had to do anyway, travel. And it’s fun. You’ll arrive at work feeling like Clark Kent fresh from the phone booth. Superhero. Commute by Bike is a great starting point for would-be bike commuters. They cover everything from clothing to winter riding. Burn Calories instead of gas. Do it.